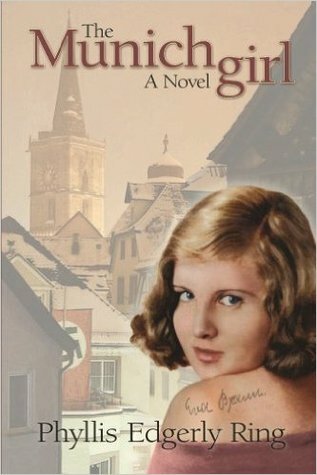 Reader and author Ginny Towler has given The Munich Girl the kind of insightful and engaged review at Goodreads a writer can only dream of. Also, a Giveaway for print copies of The Munich Girl: A Novel of the Legacies That Outlast War is up at Goodreads through May 25 (link below). “… That I should feel any sympathy with a woman who was romantically involved with one of the most heinous human beings ever to be brought into this world is disturbing to me. “Which is one of the reasons why this book is so important. “As someone who had loved film most of her life, I had wondered about Eva Braun’s importance to both German cinema and filmography, as I was aware that her films extolled Hitler’s iconography, as it were. “… Although the book is labeled fiction, truthfully, it’s hard to believe it is, as the details jump off the page. Phyllis appears to have traced the comings and goings of this enigmatic woman, who, was encamped in her various places of refuge, waiting for her man, Der Fuhrer, to return to her. “And it is in this capacity that we understand her: a woman of her time period, who turned the other way while her man went off to war, doing these “manly,” but hopelessly imbecilic and crazy things. He would return to her periodically, every couple of weeks or months, while she waited for him, dutifully. Did she remain willfully blind, ignoring the atrocities that were being committed in the name of the Fatherland? Or was she too close to him to even know what he was doing, because when he returned to her, he was her lover, not her military commander? “Was the man who could butcher so many people the same man who could come home to her, and luxuriate in the arms of his beloved, exposing his vulnerabilities to her only? I’m not sure we’ll ever know, but there’s an inkling of what Eva probably felt during the years that she was with him (17 years, I seem to count). Was there any redeeming quality in her that makes her seem more human, and less a monster of historic proportions, in our hatred of all things Third Reich? You’ll have to read to find that out for yourself. “Above all, this book is about women. About friendship. About the way we protect each others’ vulnerabilities. Of the secrets we keep. And about our loyalty to each other, though we carry out our daily lives supporting our men, as that’s what women did, especially back in the day. “… The story is also a mystery, of the history behind a portrait that hangs in the home of an American woman of English and German descent. It is a story about longing to reconnect with our beloved deceased, of learning the things that our parents could not tell us for fear of destroying our own lives yet to be realized. Phyllis has done a very brave thing, sharing a history with us that might be part of her own past, on some level. But the care that she took in making it plausible is also a gift to the reader. She dares look at the soul of the German during WWII, and the aftermath, in a reconciliation of sorts, that still hasn’t been accomplished beyond the Nuremberg Trials, except through the bravery of women like Phyllis who are willing to open the door a crack to give us an opportunity to ask questions, ponder, and reconcile our humanity with our inhumanity. Giveaway ends May 25 – 15 print copies available. Categories: Creativity and spirit, The Munich girl - A novel, This writer's path, World citizenship | Tags: Eva Braun, Fiction, Friendship, Germany, giveaway, Goodreads, historical fiction, history, Hitler, Love, reconciliation, The Munich Girl: A Novel of the Legacies That Outlast War, Third Reich, women's lives, WWII history, WWII novel | Permalink.